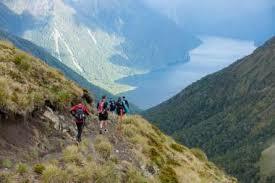 I write this from Te Anau in Fiordland, as yesterday I completed the Kepler Challenge. This is a 60km mountain run, with a few good sized hills to make it interesting. 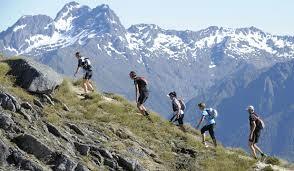 The event follows the route of the Kepler Track, which is a four day tramp. My watch informed me I had ascended over 1600 metres by the time I finished. The weather was looking dodgy all week leading up Saturday and at the briefing on Friday night they said gales - which means six metre waves in Foveaux Strait. If it was severe gales we would not be sending you over the tops, however the good news, we were told, is - it is only gales. Snow was forecast to fall above 800 to a 1000m. At the high point of the event you are at 1500m. It looked like it would be a fun day. As it was not an optimal day for photos, I pilfered a few from the net, to demonstrate what the view can be like on a good day. The weather on the day was good, with a gusty wind that was not too bad. As I come from Wellington I am used to strong winds so this didn’t worry me too much. Thankfully there was no snow, although we did get a hail shower that helped exfoliate the bare legs, as we headed over the tops. The highlight for me was going over the tops. Although the claggy cloud came and went, and sometimes the wind blew strongly, the view was fantastic; seeing the dark grey blues of the lakes, Te Anau and Manapouri, along with the greens and browns of the precipitous slopes above the bush line as they headed to high snow topped peaks, being able to see many definitions of ridges, one behind the other as the mountains went into the distance, all made for a magnificent sight. I felt good for the first six hours. I considered I was running within myself and had reserves left for the last section. I was aiming to complete the event in around ten hours, however I slowed during the last twenty kilometres and ended up doing 10 hours 47 minutes. I was satisfied, even though I had slowed I always knew I was going to finish, and I was well ahead of the cut off times. Like all previous posts about running, I came near the rear of the field. You had to write a small comment on your entry for the finishing announcer to say as you neared the finish line. Mine was: A specialist back of the field runner, his role is to make other people look good. The announcer kindly told me I had succeeded in my mission. At the end of the event, I was looking forward to beer and sausages. Unfortunately it was raining, and was not particularly pleasant at the finish line, so my wife and I hopped in the car and went back to our accommodation in Te Anau. There I had lamb and mint sausages from Cameron Harrison. These snarlers have a good minty aroma, the combination of chunky grind lamb with a nice balance of mint went down well after a knackering run. This was washed down by a pale ale from the Herne Brewing Company based in Tapanui, Western Otago. It was called Tane – a manuka smoked pale ale. This beer has elements of bitterness that are complemented by sweet smoky malt. It went down easily after the exertions of the day and both were very enjoyable. So at the end of a hard day, the body deserves replenishing, and what better way to do this that with beer and sausages. Today I am quite stiff and sore, however as the week goes on I know I will recover and look back with pleasant memories and a sense of satisfaction and achievement about the run, the beer and of course the sausages. Will I be back for another foray to the deep south to complete the Kepler Challenge? Or will I seek new adventures? For links to the rest of this series click here. Fantastic read Don, well done e hoa.